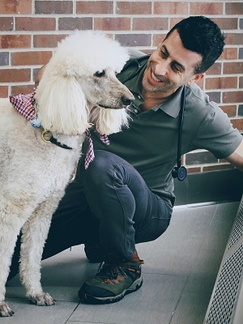 Dr. Steven Friedenberg is an Assistant Professor of Small Animal Emergency & Critical Care Medicine and Genetics. His primary interests include autoimmune disorders such as Addison’s disease and autoimmune hemolytic anemia (IMHA). His research focuses on understanding the genetic and immunologic mechanisms that cause these diseases in dogs. Additionally, he studies other complex genetic traits, in particular various canine cardiac and neurologic disorders. Our lab studies complex/polygenic traits in dogs, with a particular emphasis on autoimmune disorders like Addison’s disease and immune-mediated hemolytic anemia. We are also interested in applying “big data” methods to veterinary medicine to help improve patient care and outcomes in a wide variety clinical disorders. Our work relies extensively on next-generation sequencing technologies and computational resources such as the Minnesota Supercomputing Institute. Friedenberg SG, Lunn KF, Meurs KM. Evaluation of the genetic basis of primary hypoadrenocorticism in Standard Poodles using SNP array genotyping and whole-genome sequencing. Mamm Genome 2017;28(1-2):56-65. Friedenberg SG, Meurs KM, Mackay TFC. Evaluation of artificial selection in Standard Poodles using whole-genome sequencing. Mamm Genome 2016;27(11-12):599-609. Friedenberg SG, Brown DL, Meurs KM, Law JM. Lymphocyte subsets in the adrenal glands of dogs with primary hypoadrenocorticism. Vet Path 2016, Epub Ahead of Print: https://doi.org/10.1177/0300985816684914. Friedenberg SG, Buhrman G, Chdid L, Kennedy L, Olby NJ, Guillaumin J, O’Toole T, Rose RB, Meurs KM. Evaluation of a DLA-79 allele associated with multiple autoimmune diseases in dogs. Immunogenetetics 2016;68(3):205-17. Friedenberg SG, Meurs KM. Genotype imputation in the domestic dog. Mamm Genome 2016;27(9):485-94. Friedenberg SG, Chdid L, Keene B, Sherry B, Motsinger-Reif A, Meurs KM. Use of RNA-seq to identify cardiac genes and gene pathways differentially expressed between dogs with and without dilated cardiomyopathy. Am J Vet Res 2016;77(7):693-99. Friedenberg SG, Strange HR, VanGundy ZC, Crouser ED, Guillaumin J, Papenfuss TL. Effect of disrupted mitochondria as a source of damage-associated molecular patterns on the production of tumor necrosis factor ? by splenocytes from dogs. Am J Vet Res 2016;77(6):604-12.